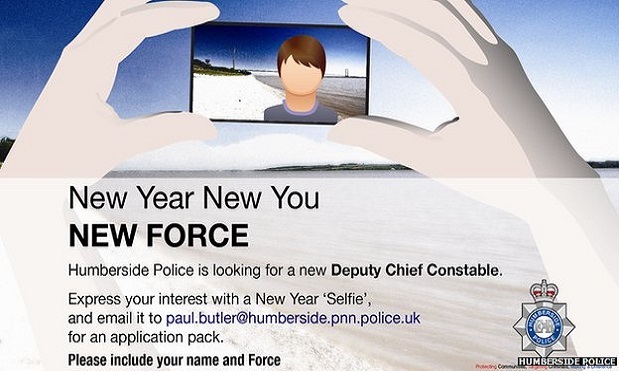 In a new way for applicants to apply for a role, a police force recruiting for a new deputy chief constable has requested that applicants submit a “selfie” as part of the job application. The post has been advertised by Humberside Police on its website for the £117,000 a year role, with the Chief Constable for the force saying that it was “vital candidates embraced new technology”. However the job application has received criticism due to the serious nature of the role, and the force should not have used the tactic for a very serious role that commands a degree of respect in the community. A director of Fred Marketing, Emma Pearson-Kendall, said: “You would hope in a role this serious people would take it seriously. The advert has been defended by the Chief Constable Justine Curran and said the force had “invested heavily in new technology in a bid to modernise the way we work”. She added: “We currently have a vacancy for a Deputy Chief Constable which is a key role within the force and as such it is vital that potential candidates understand the importance of embracing new technology within Humberside Police at the point of applying for the role.